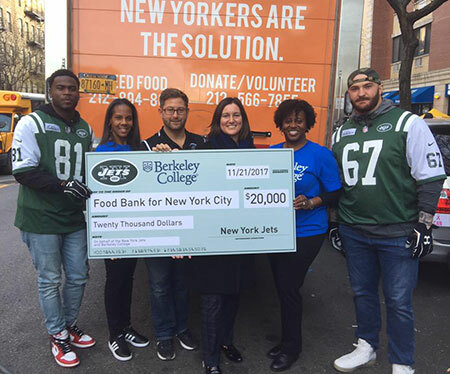 Photo Caption: Berkeley College and the New York Jets partnered with Food Bank For New York City to tackle hunger this holiday season with a donation of $20,000 to the hunger-relief organization. Following the check presentation on November 21, 2017, more than 15 Berkeley College students and officials helped current Jets players and Jets Legends prepare and serve a pre-Thanksgiving dinner to more than 400 guests at Food Bank For New York City’s Community Kitchen in Harlem, NY. This donation will provide 200,000 meals for New Yorkers in need this holiday season, a time of year that proves especially difficult for the 1.5 million New Yorkers – including 339,000 children – who struggle with hunger year-round. Pictured above, Berkeley College officials and Jets players Quincy Enunwa (Number 81) and Brian Winters (Number 67) present Seana Weaver, Director, Community Kitchen, Food Bank For New York City (third from right), with a check for $20,000. Berkeley College officials pictured above from left to right are Iessa Sutton, Campus Operating Officer, Brooklyn; Ted Havelka, Campus Operating Officer, Midtown Manhattan; and Dallas Reed, Vice President, Student Development and Campus Life. Pictured below (left), Ms. Sutton and Jets Legend Erik Coleman (Number 26) unload turkeys for a pre-Thanksgiving dinner at Food Bank For New York City’s Community Kitchen in Harlem. Pictured below (right), Berkeley College students Teyvon Bussey of the Bronx, NY; Darius Ward of New York, NY; and Rebecca Aguilera of Maumelle, AR, assist Jets players with preparing and serving pre-Thanksgiving meals. Pictured at the bottom, Mr. Bussey and Mr. Ward assist Jets players and staff from the Food Bank For New York City’s Community Kitchen serve meals. Mr. Bussey and Mr. Ward are teammates on the Berkeley College Men’s Basketball team.